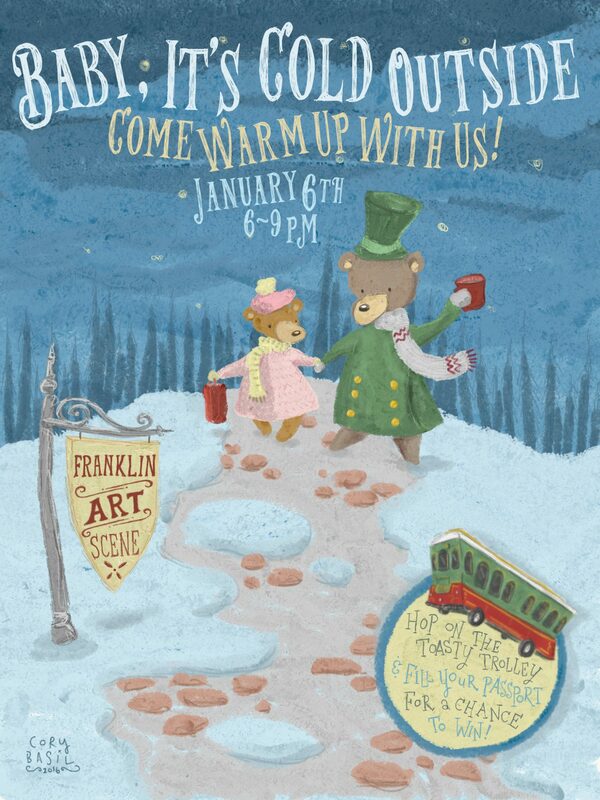 Venture out of winter hibernation for January’s Franklin Art Scene! The Franklin Art Scene is inviting the public to come out of winter hibernation for the first Friday crawl of 2017 on Friday, Jan. 6. Guests won’t have to brave the chilly temperatures for too long during the smaller and more intimate edition of Art Scene– the Toasty Trolley, complete with hot cider, will be making the rounds throughout Downtown Franklin, allowing art lovers to hop on and off from 6 p.m. to 9 p.m. In addition, the free monthly event — coordinated by the Downtown Franklin Association (DFA) — is bringing back Art Scene Passports, offering event-goers the chance to win a prize package for an evening out in Franklin, including a $75 gift certificate to 55 South and two tickets to a movie at the Franklin Theatre. Those who visit eight participating Art Scene locations, receiving stamps at each, will be entered into the contest. Visitors can escape the cold weather by heading into the Williamson County Archives for a special scavenger hunt where they will also have the opportunity to be the featured “artist,” by filling in a drawing of a historical object found in the museum. Bagbey House and More, located at 134 4th Ave N, will showcase the talents of the new owner, Phil Baxter. His repurposed lamps and shades bring a unique vintage style to any home. Come check the lamps out as well as many other repurposed items he has to offer. Historic Franklin Presbyterian, located at 435 Main Street, will host two artists- Pam Brown and Liz Kelly Zook. Pam Brown is an intuitive abstract painter who paints with fire; her main tools are a blowtorch, pigments and powders used to create textural images created with multiple layers. Zook’s art is a mix between Pop and Illustrative art. She uses a lot of bright colors and is inspired by pop culture, comic books and anything that makes her laugh. Imaginebox Emporium, located at 311 North Margin Street, will be featuring the original illustrations created by Cory Basil. Basil’s creations are painted using multiple mediums, including watercolor, oil, and gauche. His cozy gallery is not to be missed! Emily Newman is the featured artist for January at Savory Spice Shop, located at 324 Main St. This self-taught artist specializes in heavily textured oil and acrylic painting. All mediums used are heavily textured in style, giving them a three dimensional appearance. Her monochromes compliment many environments from the office to the home, and the abstracts please admirer’s of modern and contemporary art styles. Ben Paty’s wood works will be on display at the Williamson County Visitor Center, located at 400 Main St.. As a member of the Tennessee Association of Woodturners, he has been turning wood for the past three years and has developed techniques from master crafters.